Blog What Are The Types Of Hydroponics Systems? What Are The Types Of Hydroponics Systems? If you are about to start growing plants at home using hydroponics, there are quite a number of factors to consider beforehand that will determine the success of your venture. Even then, the most seasoned hydroponics growers too can run into problems along the line. 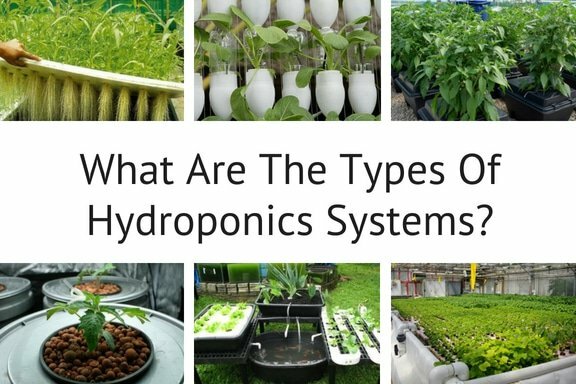 Understanding the types of hydroponics systems, how they work , choosing a system, and even what plants to grow in the first place can seem somewhat daunting. 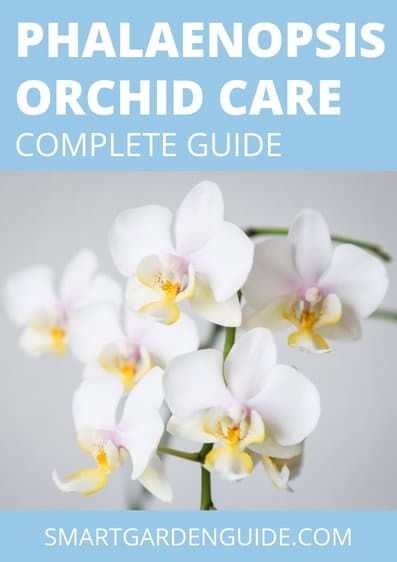 This guide will discuss the types of hydroponics systems, their pros and cons and every other vital detail about them. Hydroponics is a branch of hydroculture. It is the process of cultivating plants without soil. The plants receive nourishment through mineral nutrients dissolved in water, instead of soil. Hydroponic gardeners may use different types of inert media to support the plants, such as rockwool, coconut fibre, river rock, Styrofoam, perlite or clay pellets. See more about hydroponic growing media in this article. The concept behind hydroponics is to bring the plant’s roots efficiently into contact with the water, oxygen, and nutrients that are essential for growth. There are many ways to practice hydroponics and we will examine them after considering the pros and cons of growing plants without soil. Plants grown using indoor hydroponics systems don’t depend on growing seasons to flourish. The result is all year harvest achieved in less time than soil-grown plants. Experienced hydroponics farmers report that they get yields up to double what they would normally expect from soil-based farming. This is possible due to the efficient delivery of water, nutrients and oxygen to the plant roots, faster than would be the case in soil. Hydroponics systems use up to 90% less water than soil-based farming/gardening, due to re-circulation of the water used to irrigate the plants. No negative environmental impact from water run-off. Reduced possibility of fungi, soil-borne diseases, or pests. Hence there’s little or no need for pesticides. It requires less labor compared to traditional farming. It can be expensive to set up depending on the type of system used. Although there is less physical labor involved, managing this system requires diligence and daily monitoring. If the delivery of nutrients, oxygen or water to your plants is interrupted, the plants can suffer and die very quickly. Hydroponics is often not cost effective. The first item on the list is one of the simplest and oldest hydroponic techniques. It’s often regarded as a “passive” system since it doesn’t require water or air pumps to work. In this arrangement, water and nutrients move from a reservoir to a plant’s roots via a wick. The plants are suspended in growing media and held in place over a reservoir of nutrient-rich solution. One end of the wick is placed in the growing medium and the other end drops into the nutrient solution. The wick is usually made from absorbent rope or fiber and quickly soaks up the nutrients while delivering it steadily to the plant roots. Wick systems work particularly well for small, home-grown plants, and this is a great choice for a home-based hydroponics system. However, it’s critical that the growing media used can transport nutrients and water very well. Some good options for that are coconut coir, vermiculite or perlite. Very “hands off” and requires minimal intervention. One of the simplest types of hydroponics systems to use and understand. Excellent for small home-grown crops, and also for children and beginners. Not suitable for large plants that require more nutrients. Mistakes with placing the wick can cause rapid death of the plants. This system is more prone to fungal disease and root rot due to the constantly wet and humid conditions. You have less control over the delivery of water, nutrients and oxygen to the roots due to the passive nature of this system. Deep water culture (DWC) is another simple hydroponics system. Deep water culture systems are simple and easily to build: The plants themselves are held in net pots with some growing media and placed in a way that the roots dangle into a container holding nutrient solution and water. This way, the roots get a steady supply of nourishment. 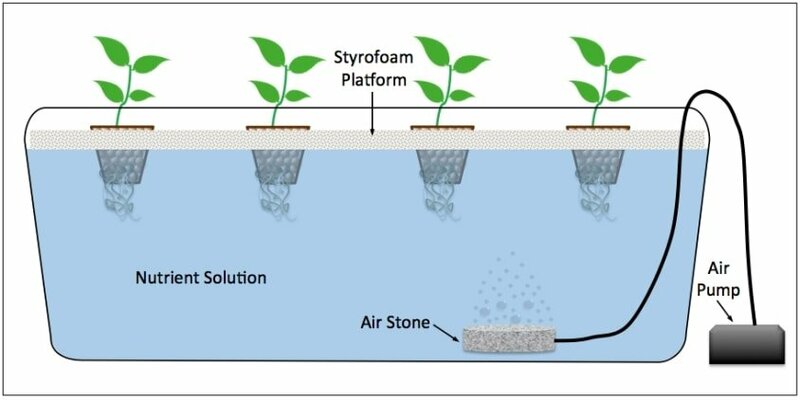 Air pumps and air stones (like in aquariums) are then used to oxygenate the water by pumping bubbles into the solution. Oxygenation is crucially important to prevent the roots from becoming saturated and drowning in the solution. DIY systems can be built very cheaply. The choice and size of ready made systems is excellent. Less technical than some other hydroponics systems, so a good option for beginners or less experienced growers. Deep water culture systems can be compact and small scale, allowing people with limited space to use it. Not suitable for larger plants or plants with a long growing cycle. If you have an air pump failure, your plants will die very quickly due to insufficient oxygenation of the roots. Careful positioning of the plants is really important. Too low in the water, and the stem will rot. Too high, and the plant will not get sufficient water and nutrients. Plants are placed in individual net pots and supported by an appropriate growing medium. The roots grow within the growing channel, where they are in constant contact with the nutrient solution. Once the solution flows from one end of the growing channel to the other, it runs off into a reservoir, before being recirculated back into the system for the plants to reuse. 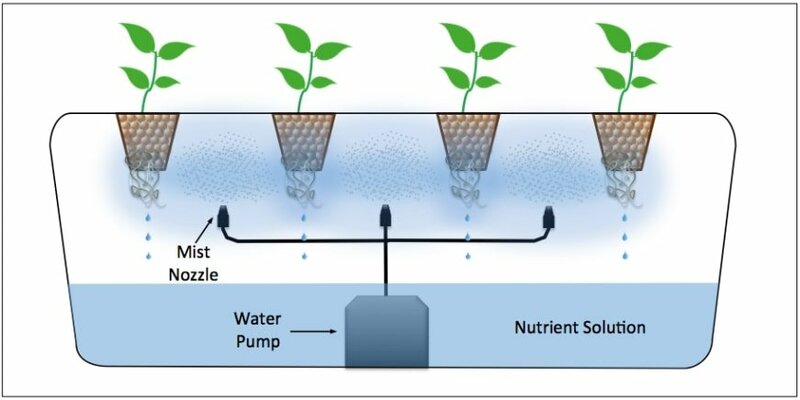 Nutrient film technique hydroponics is suitable for both domestic and commercial hydroponics. Does not require a lot of growing medium. The recirculating system ensures less waste of resources. Fewer issues with oxygenation, as much of the root mass will be exposed to the air. Requires frequent monitoring of the pumps and timers that deliver the solution. Any failure can ruin the crop. Roots often clog up the nutrient channels when they become overgrown. Ebb and flow hydroponics systems, also known as flood and drain systems, are not as popular as the other systems, but they are effective nonetheless at growing plants. In this method, the roots are not exposed to the nutrient on a constant basis. Instead, they are placed in a tray containing growing medium. Just as the name suggests, the plants are “flooded” with nutrients from a reservoir then the solution is “drained” by gravity back into the same reservoir. 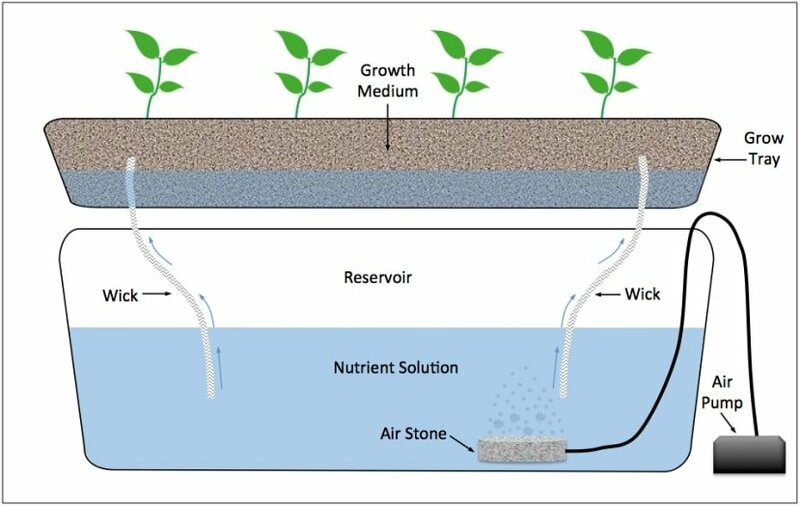 The drained liquid is oxygenated for reuse while in the reservoir using an air stone supplied by an air pump. Flooding is controlled by a timer and a water pump and the tray is flooded this way several times a day depending on the size and type of crop, and other factors. It encourages efficient use of nutrients, water and energy. Ensures sufficient oxygenation of the roots, as the nutrient solution is only in contact with the roots intermittently. It uses large quantities of growing medium. The roots can quickly dry out and die if the pumps or timers stop due to power failure or some other problem. Unfavorable environmental conditions (too hot, dry, or too cold) can also dry out the roots. Aeroponics systems are quite technical and advanced, and generally not recommended for beginners. They can, however, be one of the most productive hydroponic systems. The roots are suspended in air then misted with a fine spray of nutrient solution. Growers may choose to mist the roots at intervals or continuously. To succeed with this system, growers will need specialized spray nozzles to atomize the nutrient solution. This system also requires more equipment to operate efficiently. Interestingly, due to the direct and efficient delivery of nutrients, oxygen and water to the roots, aeroponics systems are often the most efficient and high yielding hydroponics systems. The roots are better oxygenated than those completely submerged in water. Yields and growth rates can be better than other hydroponics systems. It’s not as affordable as the other methods. The nutrient solution nozzles must be monitored to avoid failure and roots drying out. Generally not recommended for beginners due to the increased complexity of this system. Drip systems the most commonly used hydroponics systems for commercial ventures because they are simple to operate, even on a commercial scale. 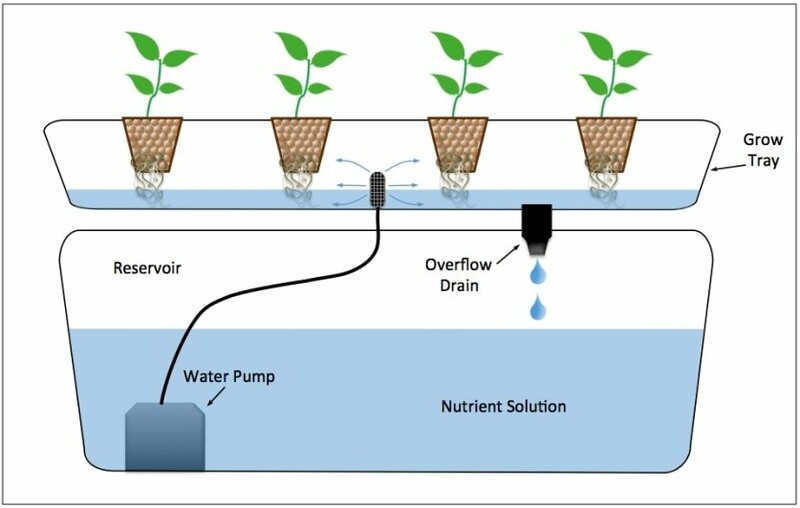 Here, plants are placed in a suitable growing medium and slowly fed a nutrient solution through a drip line connected to a pump and timer. 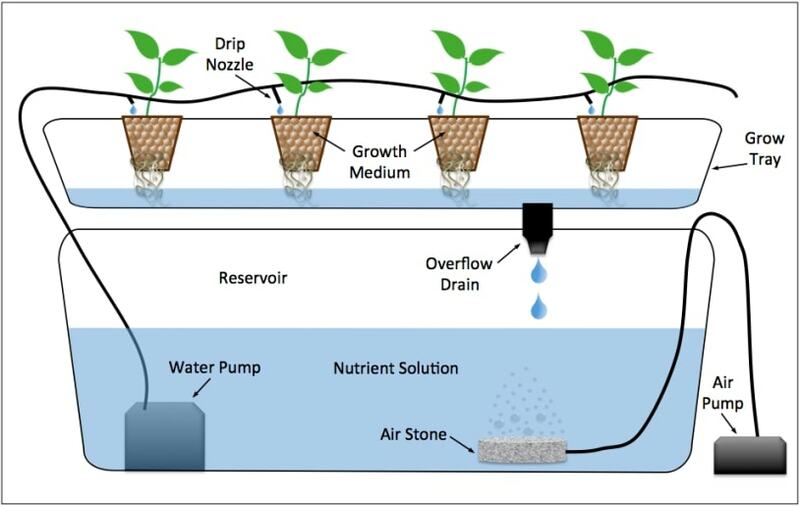 Recovery drip system: Any excess nutrient solution from the plants is collected and funneled back into the original nutrient solution tank or reservoir. This option requires more monitoring because returning excess nutrient solution could affect the pH level of the solution in the nutrient reservoir. Therefore, you would need to regularly check and correct the pH levels. 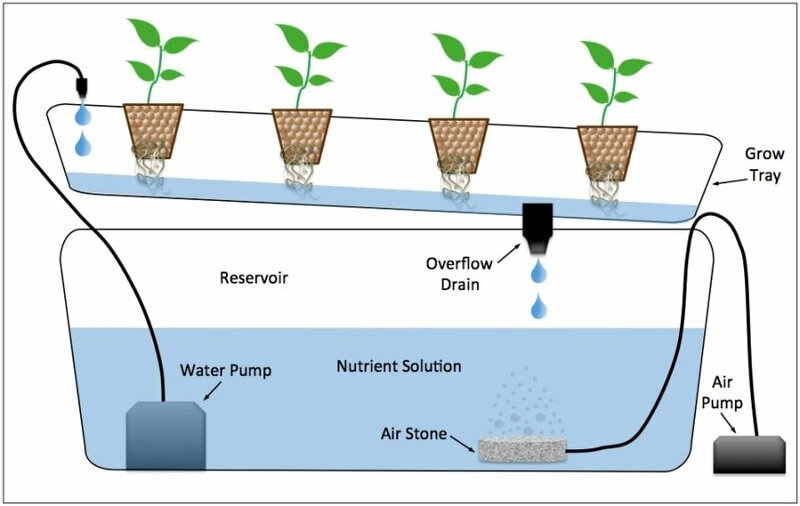 Non-recovery drip system: The excess nutrient solution is allowed to runoff so there is less maintenance than the recovery method. But, to minimize runoff, the pump has to be timed precisely. It offers better control over nutrient and water delivery. Relatively cheap to set up and maintain. The need for regular pH monitoring and correction (recovery option). High tendency to waste nutrients (non-recovery option). Is Hydroponics Hard To Do At Home? Hydroponics may sound like some alien or very high tech idea but humans have practised it for centuries now. The Hanging Gardens of Babylon were evidence of that. These days, more people are developing interest in the subject and are researching and experimenting with growing plants using hydroponics. They want a sustainable hobby and better options to grow fruit and vegetables at home. But is it possible to create or setup and run a hydroponics system at home? Certainly. The process is clearly water-efficient and is easily done in tight quarters with enough light. As a grower, you just need to know the fundamentals; what the plants need, how often they need it. As long as you monitor your system regularly and follow some simple rules, you should have no trouble. As an added advantage, you don’t have to contend with moving heavy and dirty soil all over your home or apartment. Also, tend the plants well and you can keep getting a harvest all year round. Some homeowners are worried the setup may look unsightly especially for those living in smaller quarters. But, there are many creative ideas you could come up with to blend the plants in with your decor. Too busy to set one up yourself? No problem. There are plenty done-for-you hydroponic kits available to buy and lots of online resources for you to learn more before you proceed. What Are The Best Hydroponics Systems For Home Use? We’ve already discussed each of the six systems earlier on but generally, most home growers will opt for wick systems, drip system, ebb and flow, or deep water culture. The wick system is particularly simple and easy to use. In addition, it doesn’t require excessive spending. There are no pumps, timers, or aerators to worry about. Aside from wick systems, ebb and flow systems are also common among home growers. Whichever method you choose, success or failure will depend largely on correct setup and operation of your system, adequate lighting, close monitoring of your nutrient solution and adapting to the stage and health of your plants. Is Hydroponics An Expensive Way To Grow Plants? Cost is a major concern for people venturing into hydroponic cultivation. Admittedly, the costs to start and run most systems are typically higher than traditional soil-based farming. Hydroponics systems can be as expensive or cheap as you choose to make them. A small scale DIY setup can be designed and setup very cheaply and doesn’t require much in the way of technical skill. On the other hand, a larger pre-built system for domestic use can put a big dent in your wallet, deterring all but the most enthusiastic growers. 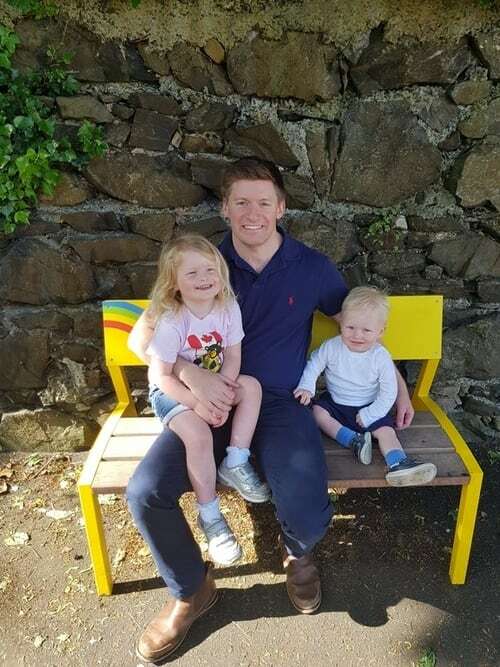 Overall, it’s a hobby that can be enjoyed regardless of your budget, but the cost will be a factor in some of the choices you make regarding type and size of system. Nevertheless, selecting a simple enough system for home use is not expensive and the benefits when the plants begin to yield far outweigh the costs. By now you’re probably wondering what kind of plants you can grow using hydroponics. The good news is, there are lots of options to choose from for your garden. Some of the top favorites that are highly recommended for home gardeners and first-time hydroponics growers include vegetables like lettuce, kale, spinach, peas, tomatoes, cucumbers, and peppers. Herbs like basil, mint, sage and chives are also excellent for your small home-based hydroponic systems. Fruit can do well too with hydroponics systems, but some of them require quite a bit of space to thrive, especially strawberries and watermelon. Strawberries, in particular, need a lot of care and attention to do well. If you are space constrained, avoid vines and climbing plants as they won’t do well in confined spaces. Regardless of the hydroponics system you decide to use, the care you put into the whole arrangement will play an important part in how fast and big your crops grow. Just choose something that works with you and your lifestyle and enjoy the flexibility and wonder of nature that hydroponics offers.